Fast Food Nation meets Shipping Container Nation in a brilliant concept that not only looks amazing, but probably tastes just as good. 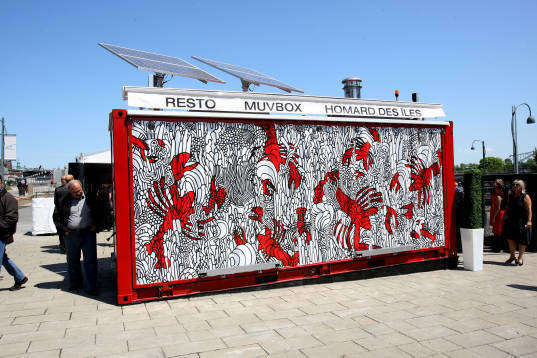 The Müvbox is a new concept, which recently emerged from Montreal, Canada and is a shipping container that opens up into a full-fledged mobile, outdoor fast food restaurant. Think Adam Kalkin’s Push Button House with a gourmet kitchen inside and a fabulous graphic paint job. Oh, and they serve local lobster from the Magdalen Islands. Daniel Noiseux, owner of well-known Montreal Pizzaiolle restaurants, placed his first concept restaurant at the Old Port in Montreal and is serving fresh, local and gourmet food at reasonable prices. The fact that his Müvbox is portable means he can pick it up and take it anywhere he wants – an outdoor festival, a new venue, a convention. 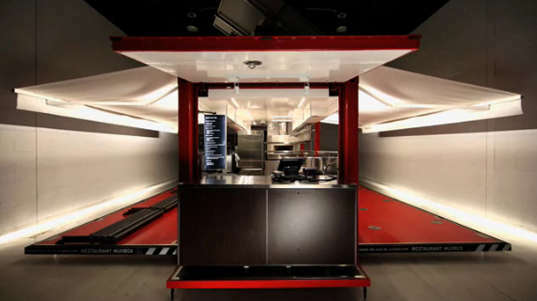 But what we really like about it is with a push of a button, the restaurant goes from closed as tight as a drum to deployed in 1.5 minutes, and with only 3-4 employees the restaurant can be fully open and running in 15 minutes. At the end of the night, take down is just as simple, and all is safe and contained inside. Müvbox is constructed from a standard 20-foot shipping container and has been retrofitted with a modern kitchen and seating for 28 people. Solar panels on the roof generate 40% of the restaurants energy needs, and most likely the remaining 60% comes from propane to fuel the kitchen appliances. The shipping container is reused and the floor is made from recycled tires. The menu is primarily local, healthy, and fresh, serving local delicacies like, Îles-de-la-Madeleine lobster, Brome Lake duck and Bilboquet ice cream. Noiseux wants to expand this concept beyond his own restaurant into other local eateries around the world – possibly cupcakes in London, ptarmigan in Reykjavik, sushi in Japan, pizza in New York. But he also thinks that the concept is applicable for other types of businesses, since the shipping containers are completely customizable. We think it is a stellar idea, beautifully executed and refreshingly mouthwatering. In fact, we think we need a field trip to Montreal to sample the goods. I’m interested in muvbox looking to open takeaway/restaurant with like concept. Please provide information design, costs of it and shipping upto Gaborone, Botswana and any other important information. Awesome! I would appreciate it if you could let me know how much this container costs, the delivery time to Brazil, São Paulo and if it you send any brochure with information about the use of it. Thanks a lot in advance. hi i am excited about this innovation! I hope it will be affordable. Please let me know the cost and how long an order takes to be delivered to dar rasalaam tanzania port, then i can collect it from there. am currently in zambia. I am planning to start my own fast food business at a temporary site. . Thank you in anticipation of your prompt response. I am excited about this innovation! I hope it will be affordable. Please let me know the cost and how long an order takes to be delivered to West Africa. I am planning to start my own fast food business at a temporary site. Do oblige me with more information on the interior accessories. Thank you in anticipation of your prompt response. hi i am very impressed by this idea.i am cracked my head trying to figure out how i can get that sort of resto to Zimbabwe.Please someone give me a quotation of the finished thing and shipment to either Durban or Beira then i will move by road across the border to Zimbabwe.Please respond. Blessing. I'm very interested in what you're doing & would like to learn more. i m a hasan kalair from uganda and wants to buy a mobil container resturant with all kitchen equipement at uganda plz can u tell me how much ur saleing to me and what is the condition of this container than i ll visit to ur place than we ll make a deal for that . Awesome. I'm beginning to use containers for homes, cabins and (almost) traditional residence units. The idea and technology are cool. MUV BOX is the COOLEST! Recycling at its ultimate. Thinking inside the BOX. I'm looking to open restaurant with like concept. Please provide information re design, costs, etc., etc.